What if Everything You Know about Health is Wrong? My life and this book could not have been possible without the gentle, guiding spirit of God. I owe immense gratitude to my entire family and every person I have interacted with and some that I have never met. I have learned from all. To my adoring wife, Andrea, I am especially indebted for the gifts and flowers of our lives, our children Victoria and Julian. To my ex-wife, I want to thank her for the blessing that emerged from the marriage, our son Jack. My children have been great teachers. They taught me how to frolic in the moment, to glee with joy, to get over things quickly, to let out a shrilling screech just because, to be patient and to play all out in the playground of life. It is because of them that everyday I become a better parent and a better person. To them I promise that I will always make time for persistent questions; I will always stop writing mid-sentence to kiss their head as they cuddle my leg; and I will always improve on my parenting ability. I promise to not criticize but to encourage, to focus on their attributes and not their shortcomings and to always teach by example. Why did this text materialize? 19. The Doctor called And He Recommended Human Touch! This text came about for many reasons. At the forefront was my personal challenge with a current medical system that did not satisfy my medical needs and because the average person needs better tools and better information to assure him/her wellness. The average busy individual relates wellness to the information received through a bombardment of special interest pharmaceutical ads. These ads can mislead people to think that health is in a bottle. This notion could not be further from the truth. A new patient, 38 year old Mary T., presented with low back pain, psoriasis and a list of symptoms and prescribed medications too large to list. She also had a history of colon cancer and currently was using a colostomy bag. I am always intrigued by the CAUSE of any disease and in particular cancer. Therefore I asked her about lifestyle, stress, and diet and how regular her bowel movements were prior to the colostomy (colon removal). She stated that she had one regular bowel movement per week. You and I may know better, but this patient did not know that in order to avoid auto-intoxication from the putrefaction and fermentation in the colon, it is important to have a DAILY bowel movement. It is my intentions for my dear patients to use this book to sum up all the things I have been babbling about throughout their treatment programs. I also wrote this book because I believe we are destined to be well. In this book, I offer practical tools and avenues to pursue the unlimited riches of this life experience in good health. It is also my goal in this text to teach biblical and other teachings of healing, to help ameliorate the ills of mankind and to help people achieve wellbeing and ideal body weight. I have come forth into this exhilarating time and into this physical embodiment to be a teacher. If you are reading this text it is probably because you are seeking to know more about health and related topics or you may be one of my many victims of my zeal and this material was thrust upon you. In either case, you will experience my passion and I hope you enjoy the material and I know you will learn something new. I always do. Even though this text is not all-encompassing, it will serve as a good, quick guide for the reader and will offer the reader a peek into natural healing from a heretic’s militant perspective. Other factors that affected this text were my travels to Central America and South America where I discovered happy people living in seemingly intolerable conditions. I asked person after person if they were happy and surprisingly the majority said yes. These people had pitiful homes; no front doors and the roofs were made of whatever scraps and materials fell off the construction trucks. I observed their interactions and noted an incredible amount of socializing with their neighbors. The children were playing around the dilapidated homes and the mothers were carrying on chores outside, never skipping a beat in their conversations. When the men returned from their meagerly paying jobs the neighborhood became more festive. Little fires outside and smell of food coming from some of the homes promised that dinner was to be served soon. I cannot help but to be a little reminiscent of the joyous and neighborly interactions I observed. When I returned to the states, I Googled the level of happiness that Americans were experiencing. I was surprised to find that more than half of America was unhappy. My goals soon expanded beyond writing and teaching on health topics. I wanted to own in my body what it is to be joyous therefore I pursued biblical teachings and seminars, and correlated the two to create a practical system that others can follow. By following simple directions, physical and mental exercises, anyone can achieve happiness. This is the background of how my other upcoming book, “Help me I’m a Christian!” evolved. It soon occurred to me that our school system teaches us a lot of material of questionable importance. In school we do not learn how to become fulfilled, loving, joyous, happy, and certainly we do not learn how to be healthy human beings. We may learn many frivolous facts and nothing about celebrating our life experience. We may achieve perfect “social accepted success” and be perfectly miserable. Are we missing the mark in our school systems? In our school systems we learn about science, math and history, yet our children do not know how to honor each other’s differences. We learn why it is important to go to college and skip the course on what is important. We study arithmetic and we do not know how to Not be sick. Forgiveness is not taught, but everyone has a lap top. Chemistry is necessary but nature is an expandable commodity. I know we all want what is best for our children; therefore I committed my life to teaching adults how to be loving, joyous and healthy human beings. Happier and healthier adults make happier and healthier children. We offer very inexpensive monthly seminars for the entire family. The objective is to teach others how to be inspired from within, rather than motivated. We are teachers of self inspiration because it comes from within and lasts a lifetime where motivation is offered by others and short lived. See appendix “D” or e-mail us at our website www.gettingwellnow.com . You may also call (850) 960-2575 for times and dates. The body is a self-healing, self-regulating mechanism. If you cut yourself the body appropriately releases clotting factors and other mechanisms come into play to heal the cut. If you break a bone the body heals it. At times you need a facilitator such as a physician to reduce or set the bone back, but the healing is always done by the body. Even if the best orthopedist in the world sets a broken bone on a cadaver (a stiff), it will not heal. Therefore, we must acknowledge a healing wisdom within the human body and I refer to this wisdom as the spirit of Christ or the spirit of God in man/woman. When working with a patient, I ask the higher wisdom within the patient for direction regarding priorities, specific needs such as nutrients, detoxification programs, any specific therapy that he/she may need such as emotional work, massage, light touch adjustments and/or other therapies. Occasionally the wisdom within the patient even recommends another therapist or physician as a facilitator. A facilitator is an individual that may assist the patient to get well. A good facilitator understands that he/she is not the healer and praises the healing Spirit of God in man/woman. I have been chosen to be a facilitator of health,but truly we are all facilitators of sorts. Some are facilitators of services and others are facilitators of products, but we are all facilitators. Not one is greater than another; we coexist in a mesh of interdependency. We all have been endowed with our gifts to humanity. The wellness care path chose me early and it is my goal to educate as many patients as possible about safe and natural healing modalities. The purpose of this book is merely to pique your interest in finding the cause of your weight gain or health challenge. I pray that you will discover natural wellness care and the miracles of the right treatments for your body. Your health and wellbeing are your personal responsibility. Occasionally I suffer a mild disconnection from the creator’s stream of wellbeing. During that short period, I blame my disconnection on the dog, the government, the I.R.S. the wife and anything else in my path. After a short walk or other positive distraction I regain my balance and once again take full responsibility for my life. This empowers me to use the God given freedom of will to be a sovereign lawmaker over my own life. To be a good facilitator of health I have to acknowledge each patient’s ability to get well and I have to hold the patient as the ultimate party responsible for his/her health and his/her general wellbeing. Most patients will hold the doctor responsible for their health and blame their spouse for how they feel. This lack of personal responsibility only works well in Soap Operas. Our health and well being is our sole responsibility and not that of any doctor of any kind. Even in this more hectic society where time seems to elude us, we must inform ourselves and apply sound judgment and common sense regarding our health choices. Our faith and foundation play a big role whether we accept chemicals in our bodies or we choose natural health care. Our beliefs partake in the decision whether to poison our body further with radiation, chemotherapy, and massive pharmaceuticals or to cleanse, purify, harmonize and balance the physical embodiment. The bottom line must be for you the reader to become more proactive regarding your health. Given sufficient time and commitment the hands-on treatments and natural therapies work consistently. It doesn’t matter if you are a stark cynic or a doubting Thomas, biblical and natural therapies work. It is also important to find the right therapy and the right facilitator to help you on your way back to health. It takes time to get well and you must be committed because even though the symptom presented itself recently, the cause may have been a significant stress or an accident twenty years ago. The body, in its wisdom, tries to adapt and compensate as long as possible. Patty K. presented in my office with chest pain and numbness and tingling in the left arm. The E.K.G and stress tests indicated no organic cause for this condition. Four years prior, the patient was involved in an accident where she flipped her vehicle and in the process one of her daughters was crushed and killed. Upon doing a consultation we concluded that the chest pain was induced by suppressed guilt. We initiated treatments of forgiveness and releasing the traumatic experience. After forgiveness we addressed the possible good and the lessons in that experience. Initially she was stuck. What’s the good in such a traumatic experience? Her determination to overcome this debilitating condition helped her find some good in that event. One “good” was that the little girl didn’t suffer, she passed away instantly. Another “good” is that now she is in a peaceful state with her creator. What did Patty K. learn from this experience? She learned to appreciate life, her other daughter, her husband and the rest of her living family to a degree that we may not ever understand. She also learned to cherish moment by moment the unfolding of her life, to glee in each instant, and to not allow a single day to run away from her without gratitude in her heart. A year later, her commitment to addressing the cause and time healed her mental and physical wounds and she made a wonderful recovery. The average patient has not yet grasped the concept that it is a lot easier to maintain the physical apparatus in good working condition by extending some level of preventative care. Things such as active lifestyle, exercise, good nutrition, pursuit of a good mental state through inspirational readings, regular hands-on body treatments, general practice of forgiveness, avoiding allergy foods etc. are all examples of preventative care. Most patients give more preventative treatments to their hunk of metal on four wheels than their own temple of the living spirit. The auto industry has educated us on the benefits of routine oil-changes. The physicians of the future must also teach prevention and not merely the covering up of symptoms with the latest drug. Covering up the symptoms is like putting perfume on the pig. It may smell better but it is still a pig. I tell my patients a story about a gentleman driving around in his red convertible Corvette and suddenly he notices that the oil light is on. He immediately pulls into a garage shop and informs the attendant of the problem. The attendant quickly grabs a pair of snips, dives under the dash and cuts the wire going to the persistent light. The attendant proudly announces, “All done, Sir”. The light is no longer on but common sense dictates that the problem is not fixed. In medicine we take the body’s warning bells like headaches, dizziness, tiredness, pain, digestive problems, insomnia etc. and we shut them up with the pill of the day…for a while, because we all know that little pills sometimes have big side effects or worse. Now that’s health care today…Take this for that and this other for that and I’ll see you in a month. Scary, huh? The warning light in a car or symptoms a patient may have are the car’s/body’s way of telling us to stop what we are doing before it causes more serious damage. Detecting a cancer or other problems early is not the same as preventing the problem in the first place. Preventative medicine is about education, lifestyle improvements, nutrition, proper breathing, exercise, body treatments, mental attitude, prayer, meditation and other recommendations we will cover here and in our free newsletter. Even though it would be nice to have a preventative medicine practice, I truly thrive on the rapid changes that are noted in my patients’ lives. The resolution of their problems gives purpose to my life. If you should find yourself in the predicament where you wore down the body of Christ beyond medical protocols, seek a natural health physician. Nature’s laboratory and hands-on treatments is God’s intended path for healing our bodies. Our filters are clogged. We are dazed and confused. Common sense, logical conclusion and application of intellect all have been aborted. The concept that weight problems as well as health problems have a Cause is foreign to the general populous. Blame it on the media and pharmaceutical special interest. They have convinced us that there isn’t a CAUSE, just a PILL solution. It is not their fault; they are just a business like any other with a product to sell. It is the consumer’s job to get educated and apply logical thinking. Assuming that illness did not just jump in your body, let us investigate the CAUSE of disease in the next few chapter. Why is America overweight? 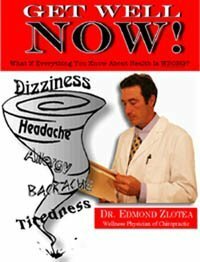 Do you get headaches because you did not take a pain medication? Is insomnia caused by an absence of sleeping pills? Reflux surely is caused by not enough pharmaceutical drugs?! I have positively confirmed with Center for Disease Control (CDC) that cancer is the outcome of inadequate amounts of preventative doses of chemotherapy and radiation; preventative doses should be administered yearly starting at 6 years of age (joke). Pain is caused by a lack of pain pills and digestive problems beckon invasive procedures and digestive aids (more pills). If this makes you laugh then perhaps you think osteoporosis can be treated with calcium. Sounds to me like the average guy and gal is ready for a newsletter. I will call it “Wake Up America! !” and it will be free. Sign up on our website at www.gettingwellnow.com. Before the reader begins to believe that I am impeccable, my wife would like to add that I do not forgo the occasional half a gallon of Mayfield Mint Chocolate Chip ice cream. She is right and sometimes it is more than occasional. Hopefully, we will not hear anymore from her on the topic of my weaknesses. To most people indoctrinated into the current medical system and its accompanying Standard American Diet (S.A.D. diet as I like to call it), the Big “C” is cancer. To me the Big “C” is the Cause. What is the Cause of cancer, insomnia, tiredness, headaches, digestive problems etc.? Confused? Without further ado, let’s visit some possible causes of weight and health problems. There is a causative factor and a solution for every ailment. Furthermore, there is a causative factor and solution for weight challenges. The causes are too numerous to list all, but the principal factors will be discussed further. The general idea is that when the body is sick it is suffering from CONGESTION. The following chapters will cover different types of CONGESTION and the Solution section will cover ways to create CIRCULATION. Circulation is the antidote for congestion. Recently, a friend wanted me to speak with his brother John G. that lives in a different state and has been recently diagnosed with multiple brain tumors. In my conversation with John, I asked specific questions regarding possible causes. I understand that cancer is an effect and not the cause. Cancer is a symptom like pain, stomach problems, insomnia etc… Cancer and other symptoms are the body’s way of crying out for help. In other words cancer is a solution (PS: reaction to/effect of) to the body being overwhelmed with stressors. The cause is the stressors and we will cover the topic of stressors in another chapter. I asked if there has been any recent physical trauma, life style changes, any big relationship stressors, etc. The big relationship stressor question got an affirmative answer. John said that he was venomous towards his ex-wife for various reasons. Upon receiving his diagnosis of brain tumors, he immediately and intuitively knew he had to come to peace with the whole experience in regards to his ex-wife. He contacted her and resolved the long standing conflict. His willingness to forgive even surprised him. Instantaneously there was a sense of peace and I felt very confident that this was not going to be a terminal case. After the entire root cause was addressed and with sensible lifestyle changes and deeper application of forgiveness principles the cancer can be made unnecessary. The body puteth and the body taketh. In a case like this, if the tumor is growing rapidly surgery is positively indicated. Nonetheless, the root cause must still be addressed or a similar cancer or issue will arise again. You have to address the cause or it will come back. John has an obvious thirst for life and no one that thirsts for life will be denied life. Occasionally the root cause is a little more insidious and it is tougher to find the causative factor. Then, we have to become better question-askers and listeners or perhaps the patient is not being fully honest with himself/herself or us the facilitators.